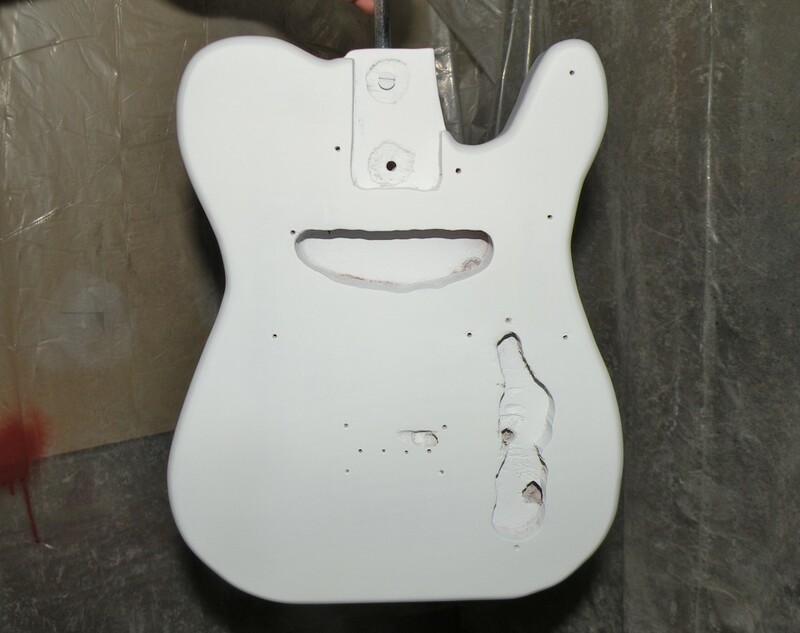 I applied a nitrocellulose primer to the sealed wood body. 2-3 coats were needed. Any slight bumps were sanded flat with 1000 grit sandpaper. 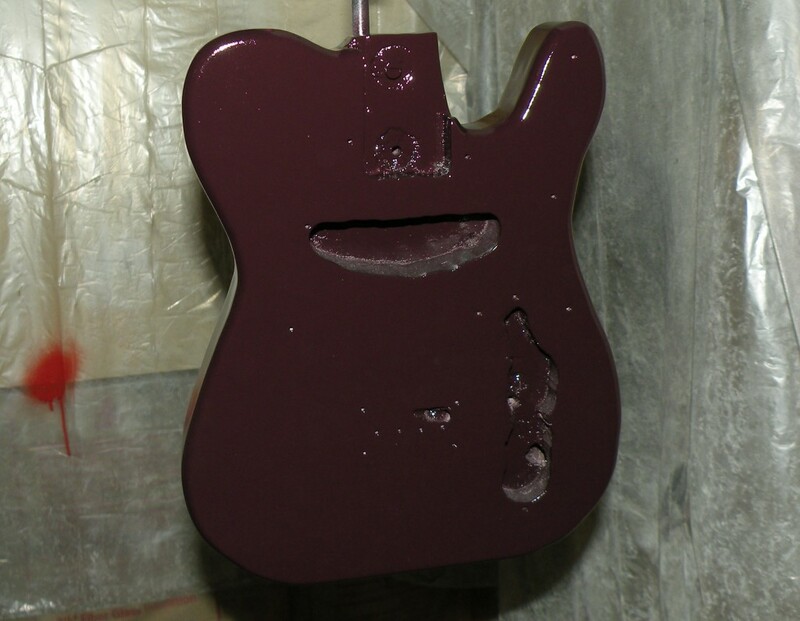 The “Midnight Wine” color coat went over the primer. This color started to worry me. I said to myself, “I don’t want a plum colored electric ukulele”. I pressed on, knowing that if I hated the color, I could always repaint. I did about two coats, then noticed that my overzealous painting had cause a couple of sags on the back. After letting it dry for a day, I used some 320 grit and then some 1000 grit sandpaper to reflatten the surface. I sanded just enough to correct the sags, but not enough to sand through all of the color coats. Once I was pleased with the surface, I did two more color coats. Next came about 6 or 7 clear coats. Clear gloss nitrocellulose lacquer was used. After the clear coats were applied, I noticed that the color had changed slightly. It had become much closer to the dark, rich “Midnight Wine” color that I was expecting. This pleased me exceedingly. Filling the grain, sealing the wood, applying the color coats, and then putting on the clear coats, makes for a nice finish. Even if you are using spray cans (like I do), you can get great results. 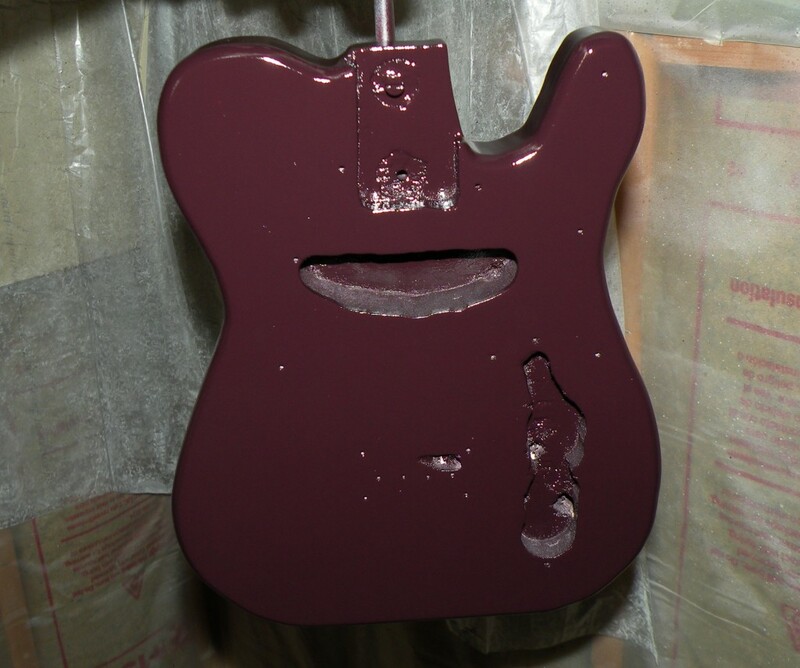 I follow the Stewart-MacDonald Nitrocellulose Finishing Schedule. The next step is the most agonizing for me. Waiting. It is recommended that you allow 10-14 days for the finish to cure before wet sanding and buffing the finish. I’m planning on waiting two full weeks before touching the body again. It will be hard, but I will be strong. Hopefully my patience will yield a beautiful, glossy finish.